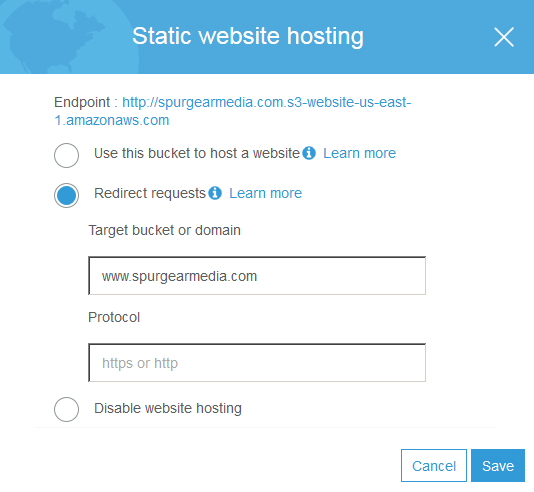 Route53 – Is the DNS provider which will allow me to change that long URL from S3 and instead use my custom domain name, in this post I’ll be using SpurGearMedia.com. 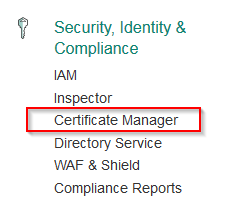 Certificate Manager – Gives us FREE SSL certificates, plus every site should be using HTTPS. CloudFront – a CDN which will not only allow our site to load even faster, but a requirement in order to use the free SSL from Certificate Manager. One final note: During this process I’ll be using the domain name SpurGearMedia.com, simply replace that domain name with your own when following these steps. 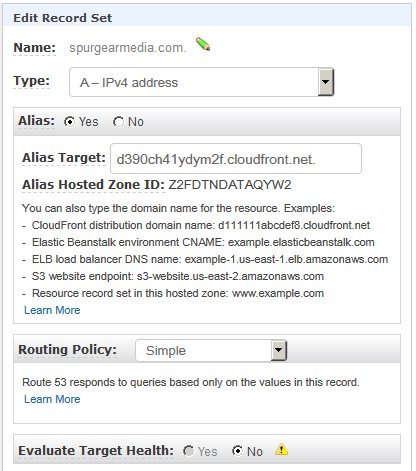 Log into your AWS account and create a bucket called www.yourdomain.com, be sure to include the www. at the begining of the bucket name as this is important. Select what ever region works best for you, for me I’m picking US East. 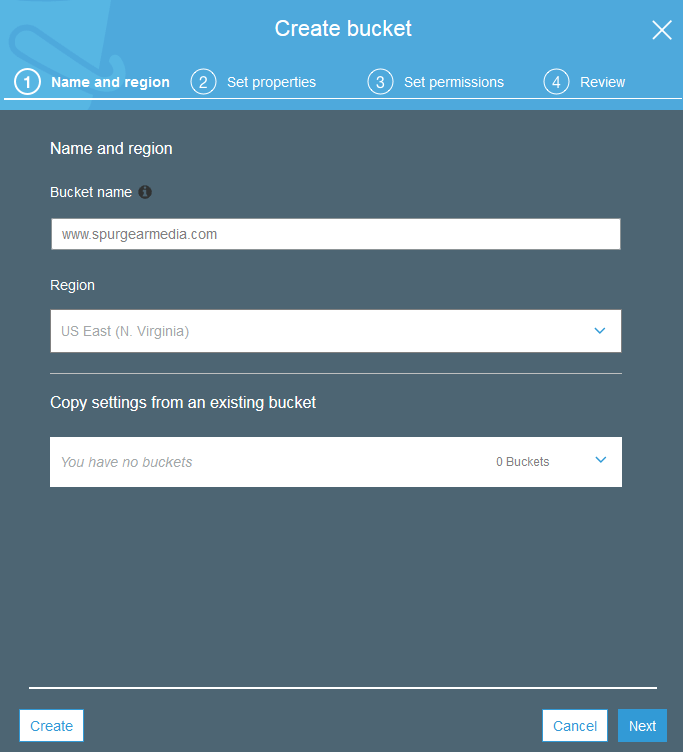 Enable static website hosting for the bucket under the Properties tab. and set index and error document file names and click SAVE. Make note of the bucket endpoint URL! Note: Be sure to replace yourdomain in the policy with your own domain name! Upload your static HTML pages to the new bucket. Click on “Request a certificate” then add your domain name. Be sure to add the *.yourdomain.com and yourdomain.com and then click on “Review and request“. 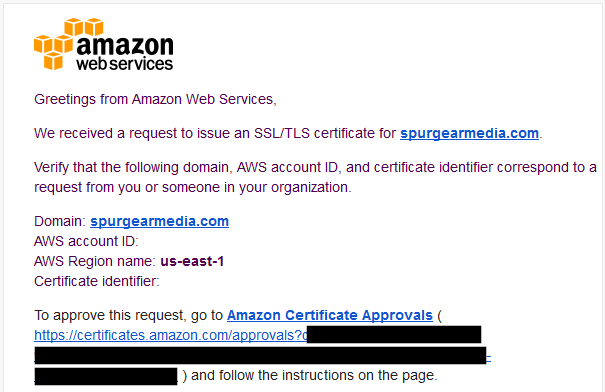 Confirm and request the certificate and then AWS will attempt to send you an email to validate the request. You can click on the arrow next to the domain name to see which email addresses AWS will attempt to send it to. This is probably the “hardest” step as you need to ensure you can get email either from the domain name or from the email associated with the domain name via the WHOIS records (in this case that would be [email protected] for me since I use WHOIS protection). 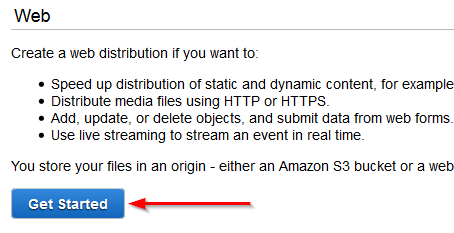 Once you receive the email from AWS, click on the link within the email to approve the certificate requests. NOTE: AWS will send you an email for both *.yourdomain.com and yourdomain.com – be sure you approve BOTH requests! Not only will CloudFront allow us to use that free SSL cert from above as you’ll soon see it will also allow use to use HTTP/2 which in many benchmarks – has been much faster than HTTP. Add to that we’ll be using the large CDN network that is CloudFront further improving our site speeds! Open CloudFront under Networking & Content Delivery. Origin: S3 Website endpoint URL – as noted in Step 2 above in the S3 section. Custom SSL Certificate: select your newly created cert from above. So while requesting and validating the certificate request is the “hardest” part, CloudFront is certainly the longest part. Not because we’ll be doing complex settings but because it takes a long time for the distribution to be created. Like 30 minute to several hours! Now it’s time to put everything we’ve done up to this part together and allow us to access our site using yourdomain.com. 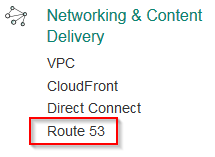 Open Route 53 under Networking & Content Delivery. 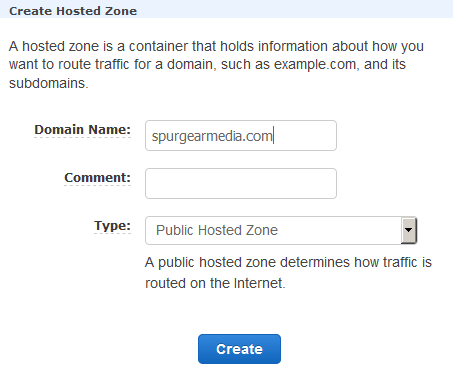 Under Hosted zones click on “Create Hosted Zone“. Enter your domain name and under type select “Public Hosted Zone” and click on “Create“. Now create a new record set. 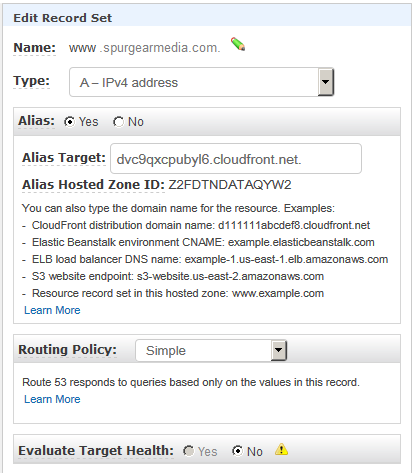 For the name type www and Type select A record (A- IPv4) and select YES for Alias, then for the Alias Target select your newly created CloudFront distribution and click on “Save“. We’re nearly finished but now we need to have the non-www version of your domain redirect to https://www.yourdomain.com. The biggest reason for doing this final redirect is so search engines won’t detect your site as two separate sites (one with www. and one without) and thus flag you for duplicate content. In a nutshell you’ll repeat the steps above with only a few minor changes which I’ll quickly touch on below. Origin: S3 Website endpoint URL of second bucket (noted in step 17). Then finally, in Route 53 create another Record Set and this time for the name leave it blank, for Type select A – IPv4 and set Alias to Yes and select the second CloudFront distribution you just created and click on “Save Record Set“. Now once DNS is updated, no matter how anyone tries to access our website – with or without the WWW or even with or without HTTPS the user will also be redirected to the single domain https://www.yourdomain.com. This redirect is a 301 redirect which is the proper way to do it and will make search engines happy. One consistent URL no matter what. Notice: If you would rather use https://yourdomain.com (without the www) as your default you can simply reverse all the steps above. So how fast is it? Per GTmetrix.com, a popular website bench marking tool my site gets a PageSpeed Score: A and YSlow Score: B and loads in 1.3s! The best part is, I don’t have to worry about managing a single server and it costs next to nothing to run. How did you change the DNS servers at Namecheap? Nothing I do seems to work. When you change your DNS servers on Namecheap you need to click on the little checkmark to the right (see linked image below). Also, the change can take up to 48 hours to take place. Great guide. 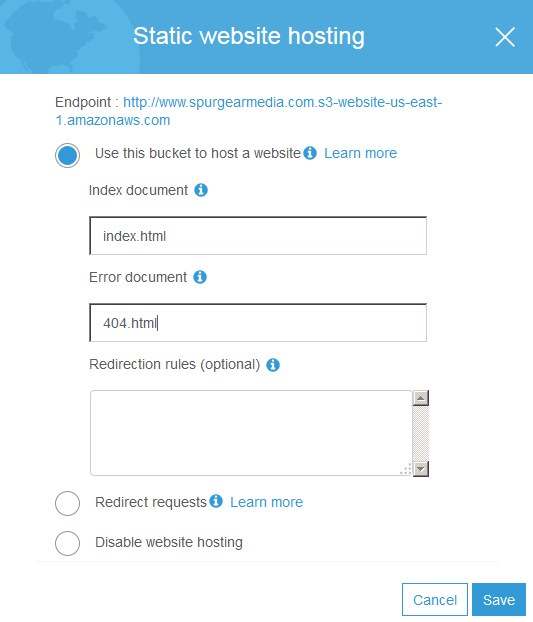 I’ve just hosted my first static website to Amazon S3.